Hi my name is Aasiyah (Ha see yah). I’m 21 and just graduated a few days ago! I design and make the clothing on AleroJasmine.com. How did you get into design? And what’s the inspiration behind your designs? I’ve always loved upcycling, I study geography and I’m really into recycling and endorsing the circular economy. I decided to sell one of my revamped creations. I used the money made from that to buy my first few yards of fabric and things have just grown from there. I am inspired by my Nigerian heritage, intricate patterns and travel experiences. What’s your personal favourite piece (one piece/look) from your collection and why? My red dahlia two piece. It’s the first two piece I ever made and when I wore it out I received one of my favourite compliments to date, ‘you look like a walking Kehinde Wiley painting’. Coming to terms that people can be cruel but you have to let it go because the anger you hold within will only affect yourself and those around you, not the person that upset you. Okay, I’m being serious when I say this but when I first started ‘AleroJasmine’ there was nothing with that name so when googling AleroJasmine ‘Did you mean AleahJasmine’ used to come up. AleahJasmine is a famous pornstar. Later on I googled out of curiosity and my website, interviews and social media pages came up instead and that was exhilarating because I felt like I created something. Being more confident with my endeavours. If, in some Freaky Friday-like situation, you could live the life of another designer or creative, for a day, who would it be, and why? Sarah Benning. She’s a professional embroiderer and I’m obsessed with her work recently, its so detailed and intricate. The way she’s able to capture an image and recreate that so meticulously is amazing. Life is never perfect so having ‘good problems’ and being able to weather any storms is my definition of happiness. And finally, what tips would you give to anybody who is looking to get started in fashion design? Do what you really want to do. Your passion will be your constant motivation and to do this full time you need that. 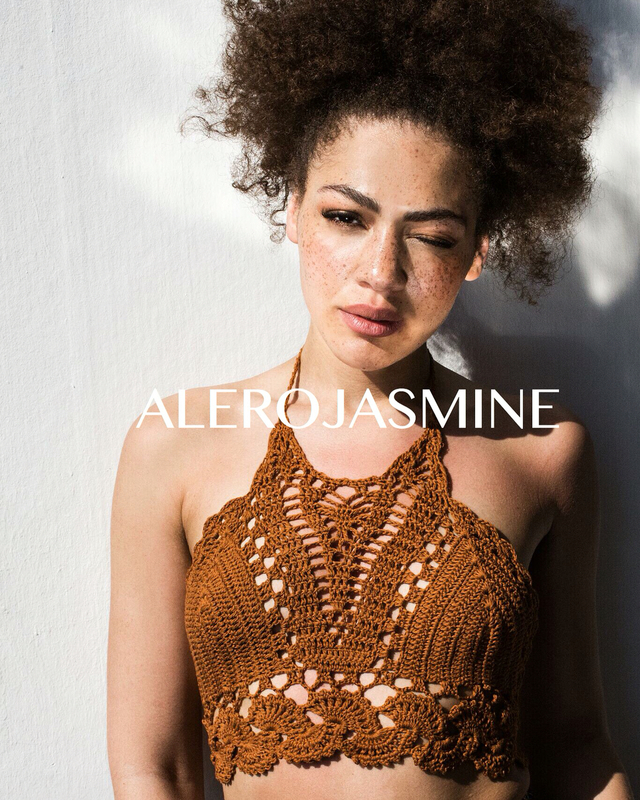 Keep up with AleroJasmine on Instagram for the latest releases and vacay inspiring imagery.